Whether you’re a solo entrepreneur or a multi-designer agency, one of the biggest expenses for anyone in visual communications is the ever-updating Adobe software. Adobe produces a collection of applications that professional print, web, interactive and mobile designers use to produce their wares. Since 2005, when it acquired Macromedia—the only thing that came close to being competitive—Adobe’s held a major share of the creative market. As a graphic and web designer, I use Adobe apps every day. At any given time my screen is showing Acrobat, Bridge, InDesign, Illustrator, Photoshop, Dreamweaver or Flash, all of which are part of Adobe’s Creative Suite (CS), currently priced at a not-so-sweet $1800. So you can understand why I, a little one-horse operation, tend to run a version or two behind, hoping to squeeze out every last dollar I can. Last week someone posted a LinkedIn question about Adobe’s relatively new Creative Cloud. She wants to know if people think it’s worth the cost. Wow, did she get a response! But first, let me try to explain this collection of applications. I hope I get it right, because it sure evokes a lot of questions. Creative Cloud (CC) is an online version of CS. Adobe wowed us with its premier in 2011 and offered it via a monthly subscription service. This seems to be the direction many software companies are going; for example, Intuit has offered its bookkeeping programs as an online option for quite some time. Instead of purchasing the license and installing software on their computers, users essentially pay a rental fee to use it from the Cloud. If they stop paying, they lose use of the application and access to their files if they failed to save them in a versatile format on their own computers. 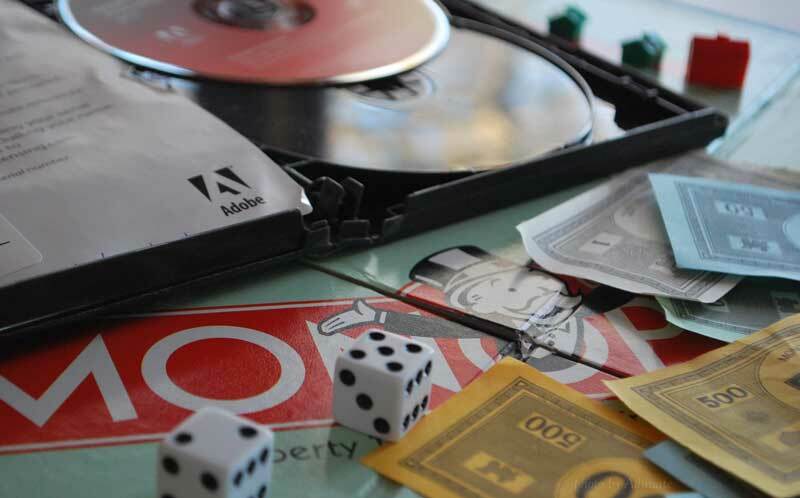 Here’s where Adobe may have put designers into what’s tantamount to Monopoly’s Community Chest: Last year it announced CS6 would be its final ownable version. All future versions would only be available via their online CC subscription service. Adobe even went so far as to pull CS6 copies off its online store (although they’re still available from its website and other retailers). Needless to say, LinkedIn commenters and much of the online world is in an uproar. Many argue that Adobe, a publicly-traded company posting revenues of $1.04 billion in 2013, has become a monopoly (legally it is not). Some designers fear they will lose access to their work if they unsubscribe. Others are upset about Adobe’s recent password security blunders. I’m certainly not opposed to Creative Cloud. At $49.99/month, it’s an intriguing opportunity to access all Adobe’s newest applications while not having to commit a huge outlay of money. Think of, say, design students who want to test their waters of interest for just a few months. Or tech junkies who always want the latest and greatest? I don’t, however, like the idea of being forced to subscribe to CC. For thousands of small business owners who, like me, have supported Adobe every workday for years, this is contemptuous. It reeks of shameless greed while holding an advantageous market dominance. It completely disregards the little guy (and interestingly, in this age of self-employment, that’s what more and more designers have become). So $49.99/month (for now—Jake, the Adobe sales rep who so patiently answered my questions, said this subscription price is subject to change). That’s $600 a year. What do you think? Do you think it’s worth the cost?